A couple of months ago I stopped at McDonald’s early one morning to get a cup of coffee. And the young woman who waited on me, who looked all of about fifteen, smiled and said, “Sir, after your senior citizen discount it will be $1.56.” I had not asked for a discount. I did not know my mortality was showing. I now regularly get letters from AARP, each one reminding me of my age. I am pretty sure that I do not yet qualify for the senior citizen discount or need AARP. And yet I’m also sure that life is fragile and mortality is real. I’ve experienced that in so many ways and I’ll bet you have too. That was once again brought home this afternoon but it wasn’t as funny as those other reminders. It was heartbreaking. It was another mass shooting, this time at a school in Florida. The first picture I saw from that scene was a woman with her arms around another women, two moms crying and waiting for news about their children. We’ve seen those kind of pictures before, too many times. This one, however, was different. The thing that caught my attention was the cross. One of the women had ashes on her forehead in the shape of a cross. She had been marked with a sign of mortality and the fragility of life, the same sign with which you and I will be marked in a few moments, and she now stood among the ashes of uncertainty, fear, death, sorrow, and loss. My guess is that when those ashes were being put on her forehead earlier in the day she never thought she would be standing where she was. Probably none of us would have either. We don’t want to consider that possibility let alone face that reality. And yet, that’s the truth Ash Wednesday holds before us. Remember that you are dust and to dust you shall return. We live in a tension between the uncertainty of life and the certainty of death. And we work pretty hard at denying, ignoring, forgetting, outrunning, and overcoming those twin realities. But they are always there. They are always present to us in the same way the ashes with which we will be marked were already a part of and present in the palms we carried last year on Palm Sunday. What’s that like for you? In what ways have those two realities, the uncertainty of life and the certainty of death, made themselves known in your life? Maybe that’s what you are facing today. The reminders of mortality and the fragility of life all are around us. They come every time a friend or loved one dies. And it’s even more stark when she or he is our age or younger. The reminder comes with an aging body, a body that no longer does what it used to do or no longer looks like it used to look. It’s a bit slower, achier, flabbier, less agile. Illnesses and accidents hold before us how easily and quickly life can change. Mass shootings and terrorist bombings leave us wondering where, when, and who will be next. The hurricanes and wildfires of last year were more reminders of the uncertainty of life. Cemeteries stand as monuments to mortality. And if you’ve ever sifted the ashes of your life you’ve surely wondered where it had gone and where it was going. So what do we do with that? How do we live with the uncertainty of life and the certainty of death? As much as we might want to escape those two realities we cannot. Nothing we can do will change or prevent them. What if naming and facing those realities is the first step in taking back our lives? That’s what this day, Ash Wednesday, is about. We mark ourselves with the ashes of mortality and fragility. We remember that we are dust and to dust we shall return. And that’s a challenge. It’s not as easy as it sounds. We can go home and wash off the ashes but the truth remains. Life is fragile and we are mortal. And it would be easy at this point to toss up our hands, surrender to the uncertainty of life, lay down before the certainty of death, and declare that nothing matters. It’s all in vain. We could become cynical and hopeless. Surely, that’s not what this day is about. Surely, there’s more to our life than that. What if we are marked with the ashes for the exact opposite reason? The ashes of this day do not mark us as a declaration that it’s all vanity and nothing matters. Instead, the ashes proclaim that everything matters. There is nothing inconsequential. Everything matters. Every word we speak, every action we take, every choice we make matters, makes a difference, and carries consequences. Every person in our life, every relationship, every moment matters. There is nothing that does not matter. What if Lent is a time of recognizing that everything matters. What if it’s about remembering and reclaiming our treasures? What if it’s about re-treasuring the things and people we’ve forgotten, taken for granted, ignored, devalued, set to the side? I know that’s not how we usually think of Lent or hear today’s gospel (Matthew 6:1-6, 16-21). More often than not we focus on what’s wrong and how we’ve taken hold of the wrong treasures and our heart is in the wrong place. I want us to come at Lent in a different way this year. I want us to look for and reclaim what’s right. I want us to re-treasure the things of our life that are of ultimate importance, the people and things that are of infinite value, worth more than money, prestige, position, power, or stuff. Maybe failing to treasure is what lies behind the pain, brokenness, dysfunction, and violence that too often fill our lives and world. Maybe failing to treasure is the sin from which we need to turn away. So tell me this. Who or what are the treasures that hold your heart? What are the values, hopes, and dreams to which you give your heart? What is of ultimate importance in your life? Maybe it’s the practices that have taken you deeper into the life of Christ. Maybe it’s the values you hold for yourself, the values by which you recognize yourself and when you live those values you know you are living from your truest and best self. Maybe it’s the qualities that brought wholeness and integrity to your life. Maybe it’s the things that keep you showing up day after day. Maybe it’s what nourishes your life and strengthens your relationships. Maybe it’s your marriage, your children, your friendships. So what if we took this Lenten season as a time of re-treasuring? To re-treasure people and relationships, to re-treasure justice and compassion, to re-treasure love, forgiveness, hope, beauty. What if we were to reclaim those and a thousand other things like them as the treasures of our life? I know how easy it is to forget those treasures, to lose them, take them for granted, or just set them aside. The busyness of life, the distractions, our sorrows and losses, our pains and wounds, and our fears can make us forgetful of what really matters or cause us to put our treasures aside. And sometimes we’re just plain old tired, worn out by the changes and chances of life. What if our Lenten practice this year was to reclaim and re-treasure that which is of ultimate importance and infinite value? What would it be like to reclaim those treasures in your life? What would it take for you to reclaim your treasures? How might that change your life and relationships? As we reclaim and re-treasure we somehow get ourselves back. We’re more whole, more complete. We reclaim and re-treasure not just for ourselves but so we can offer our treasures back to God and the people of our life. I don’t know what your treasures are but I know you have them. And I also know this. Our treasures do not exist apart from but in the midst of the uncertainty of life and the certainty of death. Even as life is changing and passing the heart-treasures of our life never go away. They are the treasures of heaven here on earth. They are the treasures that “neither moth nor rust consumes” and “thieves do not break in and steal” (Matthew 6:20). Remember that you are dust and to dust you shall return. As you are marked with the ashes of mortality and the fragility of life reclaim your treasures, reclaim your heart, reclaim your life. For where your treasure is, there will your heart be also (Matthew 6:21). It’s a good word isn’t it. It’s not, however, original with me. I heard it from a friend who is also a poet. This sermon fills a deep longing in me. It clarifies the truth of our condition: we live in the tension between the uncertainty of life and the certainty of death. And then, in the light of that reality, it leads me to choose: a life where nothing matters or everything matters. When I choose to treasure life as a gift, despite suffering, it matters. Even dark days can be transformed by that mysterious love I call God and name Jesus. A beautiful summary Elizabeth. Thank you. I agree there is a transformative power in treasuring. Thank you Father Michael, for another completely relevant, down-to-Earth, and very topical message. Your sermons are always full of wisdom. You cut through the man-made complexity and distortion of life to present us with a powerful yet simple message that everyone can take on board. And what you write brings us so much closer to God and Jesus, as well as the reality of our situation here on Earth. Bless you. From an Anglican based in North Devon, UK. Richard, thank you for your kind and encouraging words. I am glad to hear that the sermons are meaningful. I hope you have a blessed and holy Lent. Such an image those ashes created. It has continued to stay with me. On Ash Wednesday my twin daughter recommitted her life to heroin and asked me to leave. So broken by her choice, yet I treasure all my daughters beyond forever. I’ve always told them everything matters and I love you. Yet, I let go of them and ask dear God to bring someone into her heart that can break the toil of addiction. Forever a mom. Your words are an offering of deep love to all of us out here who know the unspeakable heartache of watching a child suffer. You have made the choice which matters: to speak instead of denying. Though we will never meet, we have created a moment of communion here now. That matters in ways I cannot say. Margaret, thank you for your witness and presence. You speak of the power of the ashes. When we speak and live at that level I think we find, as Elizabeth describes, a common connection and presence with one another that goes beyond the particular circumstances. And there is something to treasure in that. Peace be with you and your daughters. Very very timely for me as I celebrate my ninety first birthday on Monday. Thank you, Father Marsh. Happy birthday Jim. May it be a day in which you find yourself treasured even as you re-treasure. Yes, as if we needed more reminders. It seems Ash Wednesday is all around us. And yet, as you remind us, the promise remains. Thank you Lawrence. Thanks, Mike, for your wisdom on these recent events, “fragility and mortality”, not always what people think about until it hits close to home. 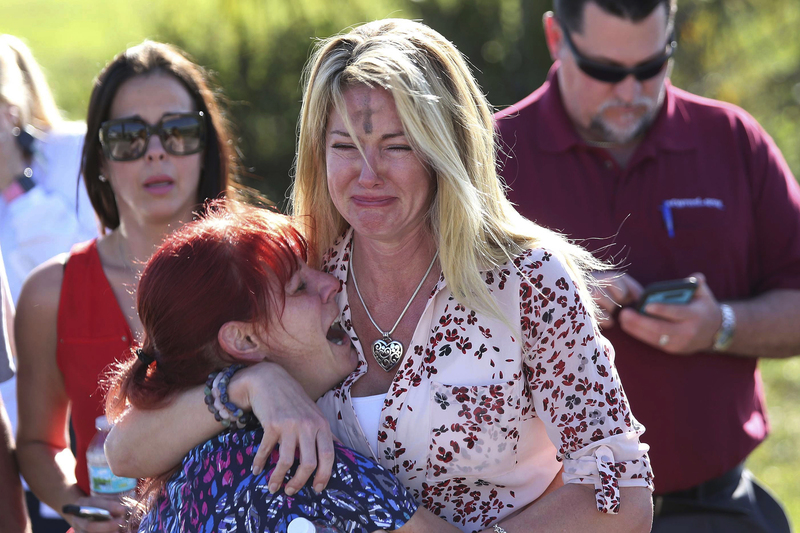 As a mother, my heart aches for the fearfully sad out comes of the Florida massacre. Life has a way of making the ashes real, holding before us what we often do not want to see or deal with. Difficult and painful days. Thank you Charlotte. You are absolutely right,dear!! It is sure dt we live in tenshion between of uncertainty of life and certanity of death.florida’s accident is an example for it.daman to satin who is enemy of love n silence.